A repeat of the flooding that last year devastated the Cornwall village of Boscastle is only likely there once every 400 years, a report has said. The Environment Agency report was examining whether the conditions behind 16 August's flooding could be repeated. But the Agency has advised the local planning authority that in most cases replacing of damaged buildings should not be prevented on flood risk grounds. It added that every rebuilding case would be considered on its merits. The Agency said that if any proposals were to come forward that would increase the flood risk, they would be strongly opposed. Otherwise, the Agency said, works were continuing on flood defences on the River Jordan, as well as further flood risk measures on other water courses in the area. Boscastle was flooded when a 10-foot (3 metre) wall of water crashed through the village after 3in (77mm) of rain fell in just a couple of hours. 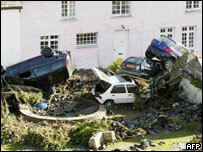 The flooding caused millions of pounds worth of damage, completely demolishing four buildings and ruining many more. The report, which released the key findings of a continuing study into the flood, said it was "among the most extreme ever experienced in Britain". It estimated that about 2m tonnes (440m gallons) of water flowed through the village. However, although the Agency said the risk of a similar sized incident was small, the possibility of lesser floods could still cause problems. The Agency's Cornwall flood defence manager, Gordon Trapmore, said: "Though the events of August could happen only once every 400 years, we know that other lesser events could still happen that could cause some damage." One resident whose business was demolished said this sort of problem meant the Agency dragged its heels about recommending rebuilding. Clovelly Clothing owner Peter Dixon said: "We hoped to open this summer, but the Agency seems to be putting problems in our way. "It means we won't be open this tourism season, I fear." Gordon Trapmore said: "We need to talk to each property owner about what the potential risks are, and we need to look at flood risks - and about access to the building and escape from them if any flooding occurs." Environment Minister Elliot Morley said "I think this report will give some reassurance of the extreme nature of this event. "There may be one or two cases where there is a balance of risk but we would hope that, apart from where there are real problems, people will be able to rebuild." The Environment Agency said it would use the findings to provide definitive guidance to North Cornwall District Council to enable decisions to be made for the village's regeneration.